'Dog And Pony Show' (Paul Black, R. 2012) Seedling #R202A. IB, 27 (69 cm). Late midseason bloom. Standards butter, wide mid red-brown washed and lined plicata band, center sanded and marked mid red-brown, dark red-brown midrib; style arms crest brown, old gold edges; falls clear mid yellow, darker yellow hafts lined and sanded dark red-brown, 1/2" red-brown plicata band dotted and lined inside, random red-brown dots over center and dart at end of beard; beards rusty old gold. Seedling #M18A: ('High Master' x seedling #J212A: ('Key To Success' x self)) X 'Love Spell'. Mid-America 2013. Honorable Mention 2015. 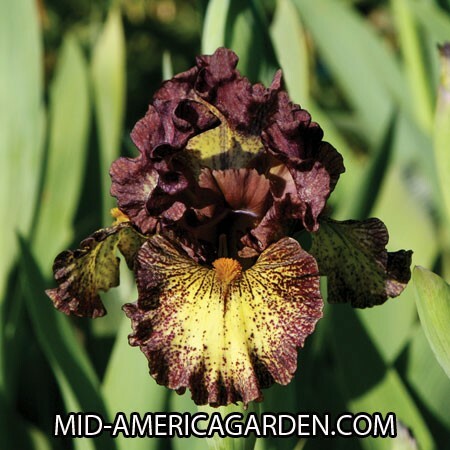 From Mid-America Garden catalog, 2013: DOG AND PONY SHOW (Black ‘13) IB Midseason-Late 27” (69cm.) Fabulous form & color. Show stalks have 2 branches plus spur & 6-8 buds. Fertile. Sdlg. R202A: (High Master x (Key to Success x self)) X Love Spell. $24.00. jpg BHP_8475-X2_dog_and_pony_show.jpg manage 103 K 21 Feb 2016 - 02:35 BrockHeilman Please contact Brock Heilman for image use.